A combination of 3 Tex-Mex favorite jellies. A jar each of our Jalapeño, Habanero and Margarita Jellies. 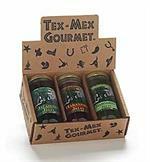 Three of our award-winning salsas together in a gift box. Please specify the salsas you prefer or mild or hot and we will customize your gift.